In space, Molek the Hunter attacks Adam Strange and Starfire, destroying their ship, trying to collect the Styx bounty. He manages to stab Starfire, and when he is bested by Starfire, he blows up his own ship. Strange pulls Starfire out just in time. 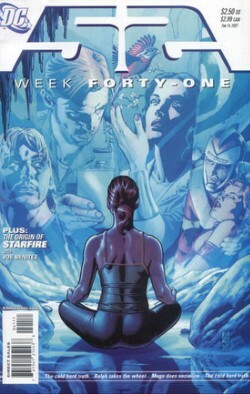 Lamenting Charlie's death in Nanda Parabat, Renee goes to the ice cave, where she finds Richard, and is bested in combat. Richard tells her to see who she can be, and Renee flees, saying that she can't. Ralph Dibny examines Morrow's old cell, and finds how he escaped. Ralph goes to Professor Milo, in a wheelchair, and rips the wheel off his wheelchair, revealing the Silver Wheel of Nyorlath, an artifact he needs, and thusly takes. The Helmet of Fate appears, and tells Ralph that the final hour is upon them. Renee meets a woman who killed a man. They converse about her fear, and the woman tells her that being afraid of her confrontation is all the more reason to confront it. Taking the advice, Renee goes to the cave, blows out her candle, and the smoke makes a question. Their ship crippled, Adam Strange and Starfire plunge into a red sun. Defiant to the end, Adam goes to work on the ship. A planet appears, and they crash into it. A Green Lantern indicates that Molek's ship exploding caused them to be sighted, and Mogo caught them. It pulls back to show Mogo, the planet they crashed into. Basically, as the title suggests. Story - 5: Still chugging along, and now leading to what appears to be the closure for all of the plotlines, which is neat, because it never had that lull I was expecting, really. This whole series has been pretty phenomenal minus a few miss issues. This issue isn't fast paced, but it does set up a ton of great things, and there are emotional beats that pull you along. Renee's confrontation is taking a bit too long to play out, but then, at very least it's now coming to a head, as is Ralph's story, which was going on a bit long as well. We knew he was going for artifacts, this issue just seemed a bit of an excuse to show him ripping an evil dude's wheelchair out from under him. But, given that it was so awesome, the extraneousness is easily forgiven. And, given the dialogue Renee exchanges, you're also willing to forgive the minor stretch. Mogo is an awesome reveal, as were the "final moments" of Adam Strange, very compelling. I'm still not as held by the space drama, as ever, but now it's heating up a bit. The opening battle with Molek was indulgent, but ultimately justified by the end of the issue. Awesome stuff, even yet. Art - 3: At times it was hard to distinguish some characters from others in the Renee scene, and the art seemed a bit rushed in ways. The paneling was also very archetypical and square. Did it tell the story, though, a to b? Yes. It was just unremarkable in ways. Back-Up Story - 5: I didn't know squat about Starfire beyond "exhibitionist who dated Nightwing," so this origin was actually pretty helpful. The origin itself is unremarkable, but at least gives her some context for me. Back-Up Art - 5: Of all the origins so far, this is my favorite in terms of art. The giant picture of Starfire framing the origin is just awesome, and it's a strong, unique take on the character. Very enjoyable. Cover Art - 5: I'm continually blown away by how awesome these covers are. They depict the issue at hand, symbolically, beautifully, and they're never outside of the spirit of the story. There have been few I haven't really enjoyed. Plus, this is probably the hottest picture of Renee I've ever seen, can't beat that. Heh.